As a teacher for 32 years, Joy Griffith sometimes felt she needed to hide her sexual orientation. 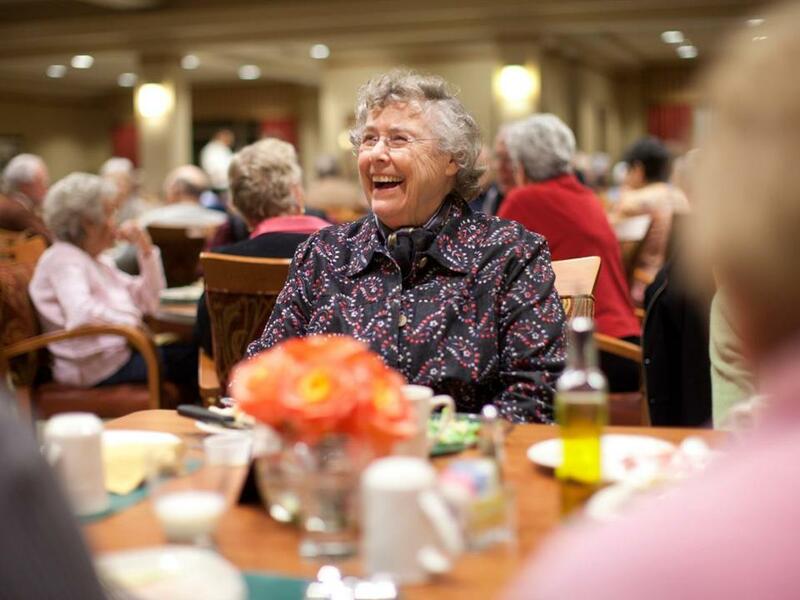 Griffith is part of a growing population of lesbian, gay, bisexual, or transgendered (LGBT) seniors who face challenges different from their straight peers. An estimated 4-8 percent of seniors today identify themselves as LGBT and the percentage is expected to double by 2030, according to the National Gay and Lesbian Task Force, as LGBT baby boomers, who are more likely to be open about their sexual orientation, age. For many LGBT seniors, their biggest concern now is not trying to conform to an unwelcoming society, but rather, who will care for them as they get older. They are less likely to have ever been married or have children, leaving them without a close relative to take on the role of caregiver. And many LGBT seniors still do not feel comfortable disclosing their sexual orientation. Lisa Krinsky, director of The Aging Project, a Boston-based nonprofit organization that advocates for the rights of LGBT elders, estimates that as many as 80 percent of LGBT seniors in Massachusetts fear disclosing their sexuality to family members and health care providers, and are unlikely to seek any sort of dependent care because of the risk a caregiver will learn their secret. “These seniors have an internalized fear of not being safe,” said Krinsky. As a result, many organizations that serve the elderly worry that those who are LGBT may die early and alone. In early November, Massachusetts adopted federal guidelines that include targeting LGBT elders for outreach, recognizing them as an underserved population. 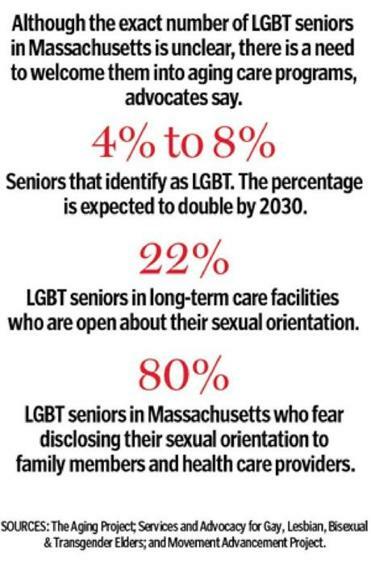 Although the exact number of LGBT seniors in Massachusetts is unclear, the need to welcome LGBT seniors into aging care programs is great, said Krinsky. She and her team train organizations that serve the aging and health care providers affected by the new directive in cultural issues and proper language to use when caring for LGBT seniors. The nonprofit advocacy group MassEquality and The Aging Project are also pushing for a bill, H1099, that is pending in the Legislature and would make training for dealing with LGBT seniors mandatory for elder-care providers. “We would have this opportunity to educate elder care providers, many of whom are really well meaning and want to connect with LGBT folks but don’t know how to,” Krinsky said. Only 22 percent of LGBT seniors in long-term care facilities are open about their sexual orientation, according to results from a national online survey by Services and Advocacy for Gay, Lesbian, Bisexual & Transgender Elders and the Movement Advancement Project published in March 2010. “A lot of LGBT seniors came of age during an era of homophobia and a time when they may not have been treated well by people in the health care system,” said Carly Burton, deputy director of MassEquality. In the 1960s, Griffith feared disclosing her sexuality to her doctors and tried to avoid gynecologic exams. “You were really careful not to let doctors know about that because the prejudice would have been quite harmful,” she said. Griffith knows people who still fear professional care, but they are mostly in their 80s and 90s. The fear of being stigmatized is another reason the approach by elder service care providers should be different with LGBT seniors, Krinsky said. There’s also concern about their straight peers, many of whom may also have a negative reaction. Griffith moved to Linden Ponds retirement community in Hingham in 2007. She has no partner and no immediate family to be an emergency contact. Because there are others like her, standard questions by health care providers should be worded differently for LGBT seniors, according to the training provided by The Aging Project. Seniors should be asked about their support system rather than children, or about their partner rather than spouse. Burton, of MassEquality, said she thinks the voluntary directive issued by the governor is a great first step, but that it may not be enough to motivate some elder-care providers to take advantage of the available training because it is voluntary. Still, caregivers aren’t the only ones who need to change. Not only do providers face the challenge of developing trust with LGBT seniors, but many seniors who have hidden their sexual orientation from formal caregivers must learn to overcome their fear. “Social programs within the elder agencies are a way to get them integrated with other similar folks and feel comfortable connecting with providers,” said Krinsky. The world has changed since she came of age, Griffith reminded herself recently. Her confident tone seemed to convey the importance of seniors being open with their health care providers.